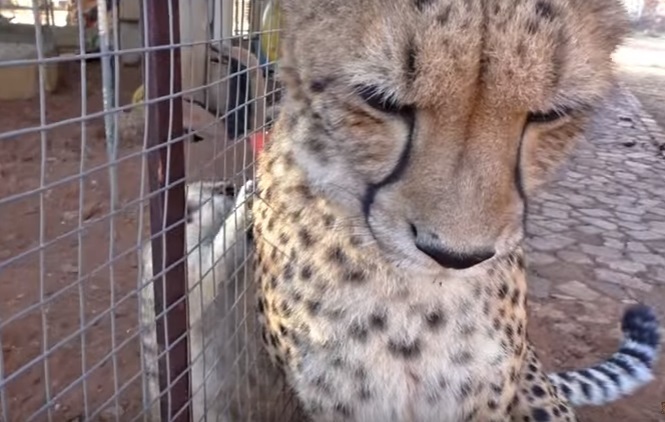 Kinji the Cheetah is something special. He honestly tries making friends with everyone... especially the animals that lives within his reach. I've mentioned before he is very clever and extremely calm and non aggressive in nature. Chloe the dog bites him on the lips sometimes when he bothers her to much and he accepts the consequences and never retaliates. He is a fun loving cheetah who loves to play and loves MEERKATS! Here he is at 8 months and 2 years old trying to get the meerkats to scratch him. He ends up purring to the delight of getting a grooming from these small creatures. He has no idea they want to kill him! Meerkats are territorial and do not like predators. Staff label Kinji as "The cheetah that doesn't purr" and it is rare for sure. I've only heard him purr when eating sometimes, playing with a toy sometimes, and encountering his meerkat friends. I was very happy to hear and record his purr. 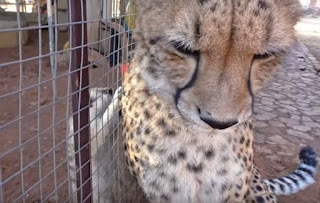 A cheetah purr is quickly becoming my favorite sound in the world... so relaxing, calming, and something that penetrates the psyche down to the rudimentary soul for me. A purrs is designed to calm tensions; letting others around them know a friendly cat is present.